Viv Grigg, a New Zealander, continues to be a prophetic voice, living among the poor of the slums and developing community organisations in Manila, Calcutta, Sao Paulo, Los Angeles... He has catalyzed several networks of communities of workers (apostolic orders) who choose to live in the slums of over 40 emerging mega-cities, creating a plethora of organizations that transform poverty. He coordinates the Encarnação Alliance of urban poor movement leaders. He also builds teams of city leaders who seek to transform the values of cities. He developed the Vision for Auckland network in Auckland, connecting ethnic and societal leaders. Currently he and a global team of educators is launching the MA in Transformational Urban Leadership. His works have been seminal in the emergence of new paradigms of incarnational mission among the urban poor, the new Western apostolic orders (new friars to some), transformative citywide revival, and transformational coversations as method of doing theology. 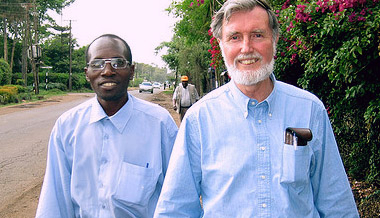 With training in theology, community organisation and urban anthropology, he teaches in universities and seminaries on Leadership Among the Poor, Community Organisation, Transformative Movements, and is author of Companion to the Poor, Cry of the Urban Poor, Spirit of Christ and the Postmodern City, Transforming Cities and others. He is Director of Urban Leadership Foundation, and associate professor of Urban Leadership at Azusa Pacific University. They raise three teens, this year in Los Angeles.